James Watson, a biologist from Indiana University, and Francis Crick, a physicist, were working at the Cavendish Lab in Cambridge, England on the structure of DNA. On Saturday, February 28, 1953 it is reported that Crick came into the Eagle, a Cambridge pub, and announced to everyone there that they had “found the secret of life”. In 1953 they proposed the double helix model of DNA. In April of 1953 the Watson and Crick paper appeared in the journal Nature 171 : 737-738 & 964-967 (1953). US Congress declared April 25th 2003 as DNA Day to celebrate the completion of the human genome project and the 50th anniversary of the description of DNA. In April 2008, BSN organized the first ever DNA day celebration in Nepal. 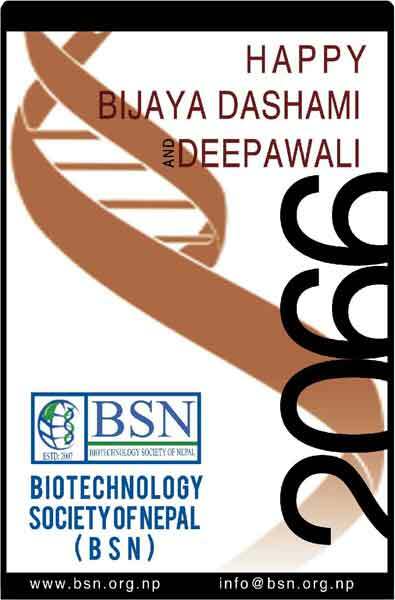 Continuing with the same spirit, BSN will be celebrating the DNA day this year too on 24thApril 2009, Friday. Our main attraction of the program will be an art exhibition on the theme “Biotechnology and DNA” prepared by the art students of School of Arts, Kathmandu University. A documentary shall also be displayed in the same theme. And some of our members will be giving a short presentation in the applications of DNA in Biotechnology. All the members and interested people are invited to our program. Your presence shall be highly appreciated. BSN organized a talk program “Challenges to biotechnology in Nepal” on the occasion of its first Annual General Meeting (AGM) on 27thMarch 2009. Both AGM and the talk program were organized at seminar hall of National Academy of Science and Technology (NAST). The Chief Guest of the program was Prof. Dr. Hom Nath Bhattarai, Vice-Chancellor of NAST. Guest speakers, Dr. Sangeeta Shrestha delivered her presentation on “Achievements of department of biotechnology, NAST” and Dr. Hari Prasad Bimb talked about corresponding activities of Biotechnology unit of NARC. Dr. Pramod Aryal from Everest biotech delivered speech on challenges to Biotech Entrepreneurs in Nepal. He mentioned the prospective project about incubation center for biotechnology R& D at NAST. This time in our talk we had Mr. Kamalesh Adhikari from South Asian Watch on Trade, Economics and Environment (SAWTEE). He spoke on biotech policies of Nepal. The program was sponsored by Intrepid Nepal, a molecular diagnostic and research center, co-sponsored by Bioscientific international Pvt. Ltd, Sero Diagnostics and Sudeep international. We are thankful to our delegates, members, guests, volunteers and the entire team of BSN for their support and suggestions. We hope to hold more innovative programs in days to come. BSN’s First Annual General Meeting to be held!!! The most awaited program to its executives & members, First Annual General Meeting (AGM) is going to be held this Friday (27thMarch, 2009). The program will be followed by a talk program where distinguished scientists working at different institutions in Nepal will be delivering their speeches on different aspects of biotechnology. We will also be discussing on current biotech policies, challenges to the biotech entrepreneurs and achievements we have made so far. A complete schedule of the program will be uploaded here, in the web-site, soon. Award distribution of the research article competition will be held on the same day. Venue: Conference Hall, National Academy of Science and Technology (NAST), Khumaltar, Lalitpur.